No cigarette and sad. Photo: Tom Williams/CQ-Roll Call,Inc. “He’s still learning how to be president,” he added. It would probably be a pay cut too. 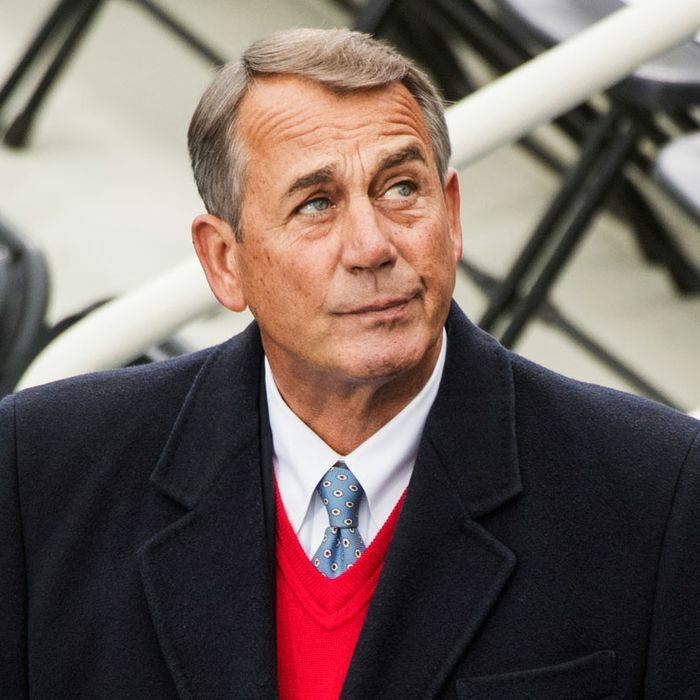 One of the many former politicians to spin through the revolving door to K Street, Boehner now has two different lobbying jobs, even if that’s not what he calls them. One is with the global firm Squire Patton Boggs, which counts Goldman Sachs and the People’s Republic of China among its clients. The firm, which also employs former Senate Majority Leader Trent Lott, calls Boehner a “senior strategic advisor.” He also sits on the board of the tobacco company Reynolds American Inc, a job that reportedly pays $400,00 a year — or the same as being president. Despite his harsh critique of Trump, Boehner did find a few things to like in the man whom he said he “never envisioned” in the White House. Trump has done a good job on fighting ISIS, Boehner said, and he “did what he could” to pass a new health-care bill. Asked about the swirling controversy surrounding the Trump administration and its relationship with Russia, Boehner said, “They need to get to the bottom of this.” But he cautioned Democrats not to get too excited about removing Trump from office. “Talk of impeachment is the best way to rile up Trump supporters,” he said.